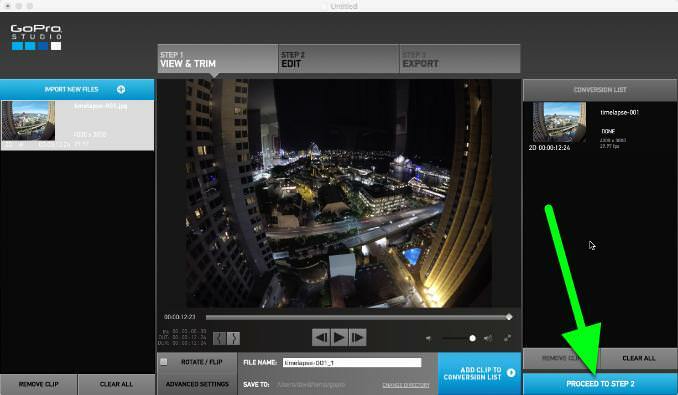 There are two different ways to create timelapse videos with a GoPro: shoot a sequence of jpg still photos to be compiled on your computer, or have the camera do the compiling in-camera to create an mp4 video from the get-go. 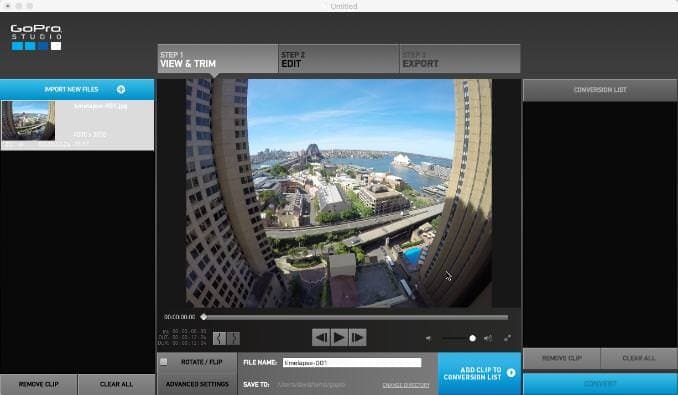 The in-camera version, also known as time-lapse video mode, is available on many of the newer GoPro models, but not all of them. And on those cameras that do have it, the output formats and interval options are not always the same. 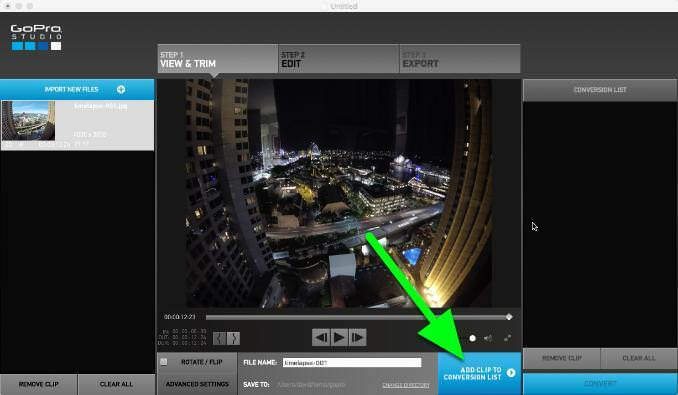 Overall, time-lapse video mode wins on convenience simply because it handles the shooting and compiling in one. But if you want more control, you can also shoot in the more traditional way by shooting a sequence of still images and then compiling those still images yourself using a computer and time-lapse compiling software. It's much less convenient, but those extra steps also gives you much more control, especially when it comes to exposure and the visual look, as well as resolutions, bitrates, and file formats. There are many different software packages that can do this, and they have all sorts of different features. GoPro Studio is one of them. 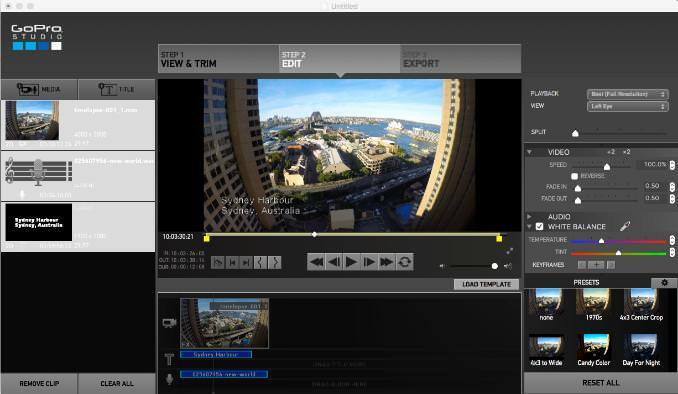 It's free, works great with GoPro's Protune mode, and it allows you to do some pretty sophisticated creative editing as part of the process. So here's a guide to compiling a time-lapse from still images using GoPro Studio. I'm focusing on the basic process, but there are other ways you can refine the process along the way. I'm assuming you've already shot the images. And I'll handle some of the fancier editing options separately at a later time. 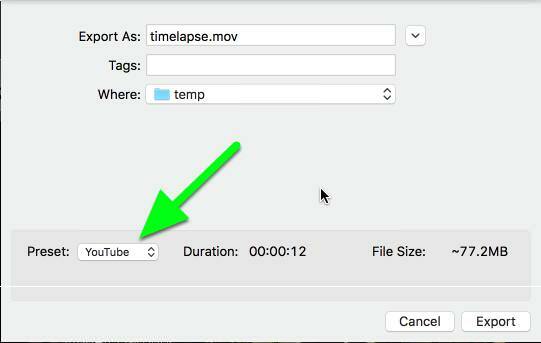 But here's how to take a sequence of timelapse photos you've shot with your GoPro to create a simple timelapse video you can share on Youtube, Facebook, or elsewhere or save it for later editing. 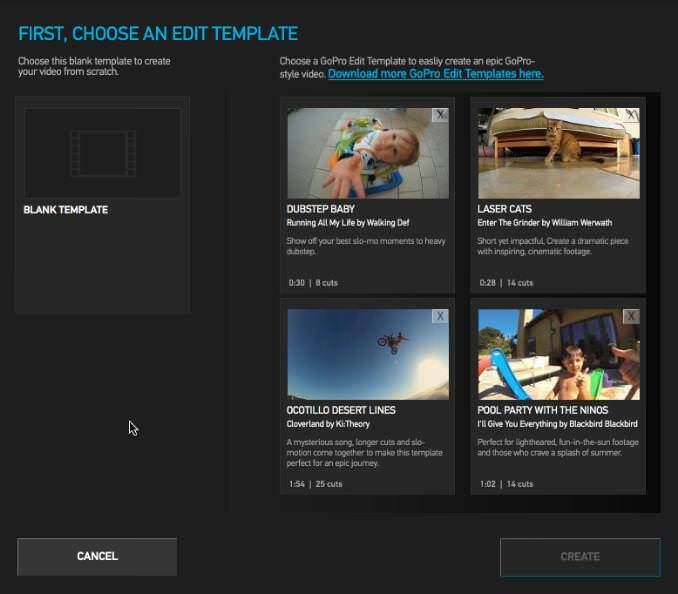 You'll first need to import all the images so that they're available for GoPro Studio to work with them. You can do this by hitting the Import New Files panel, going to File & Import Media or using the keyboard shortcut ⌘I (on Mac) or Ctrl+I (on Windows). In other types of situations, there might be pros and cons to separating out your images into different folders, but in this case it makes things infinitely easier if you have all of your images in a single, dedicated folder, named sequentially. 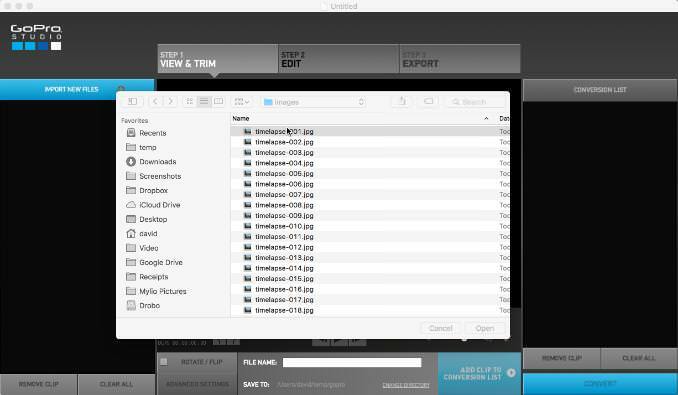 GoPro Studio is smart enough that if you select the first file it'll automatically pick up that it's an image sequence and bring them all in. You can select all the images if you like, but you don't have to. It'll then take a few seconds to build a reference movie, which is what's used for the first part of the editing. 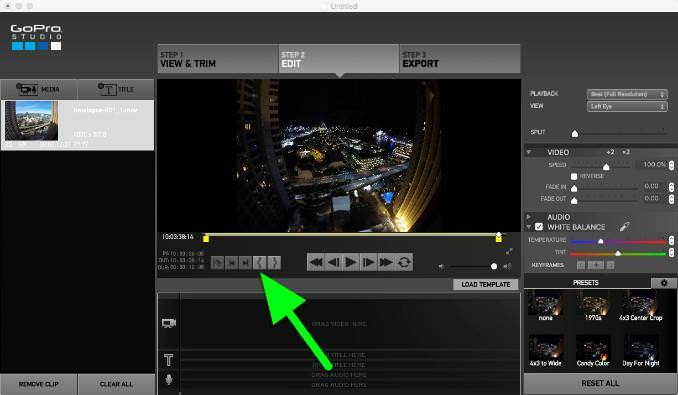 The new reference movie is put in the left-hand panel that shows clips. If you click on it, the active clip will show up in the main, center window. You can now preview the sequence using the play button in the middle panel. 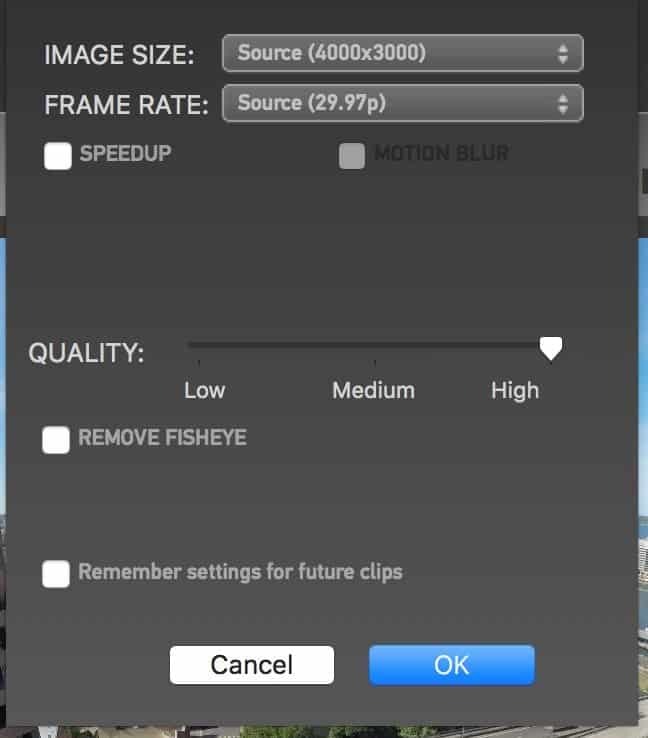 If you hit the Advanced Settings button at bottom left, you can set the image size that will be used for the video, the frame rate, and the quality. Assuming it's got all the images you want in the sequence, the next step is to hit the "Add Clip to Conversion List" button. The clip then gets queued in the right panel called Conversion List. 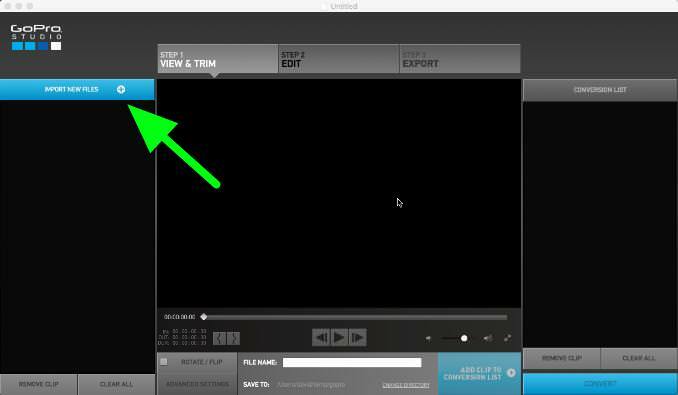 If you're adding more clips, repeat the process to add them to the Conversion List panel. Once you're done, hit the Convert button. This compiles the sequences into a working video file ready for editing. Depending on how long and how many your clips are, it might take a few minutes. You'll see a preview in the small thumbnail while it's working. Once the conversion process is finished, the Convert button will change to a Proceed to Step 2 button. Click that. You'll then get an option to choose an edit template. For now, to keep things simple, just hit Cancel. 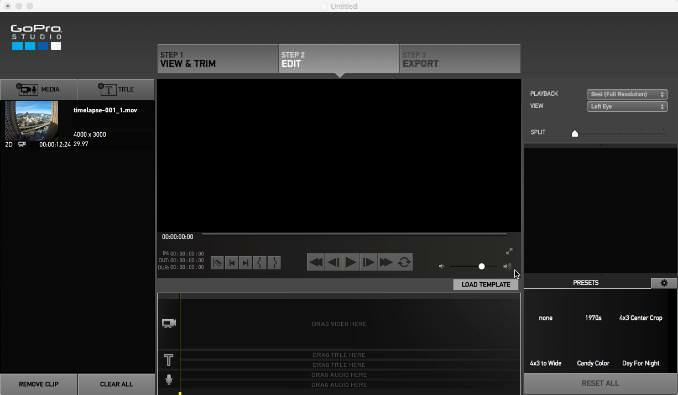 When you first open the Edit step, the center panel will be blank. That's because you haven't yet selected an active clip. So click on your clip from the left panel. There's no requirement to work in a particular order with the editing tools, but as a first step, I like to trim the beginning and end of the clip. 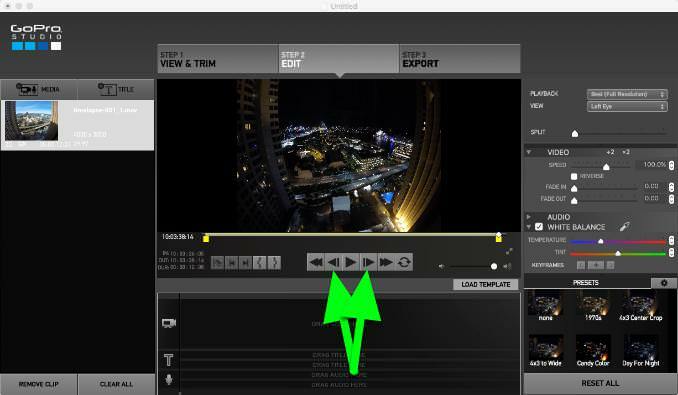 To do that, move the playhead to the precise frame you want as the first frame of the clip. You can use the arrow keys to move by individual frames or use the buttons immediately either side of the play button that look like a combination of play and pause button. Then you can hit the Mark In Point button. Repeat for the end of the clip, using the button next to it. 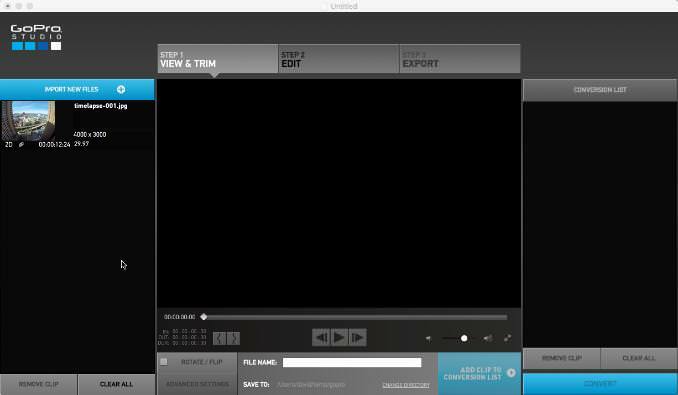 Because the file is now in video form, you an apply all of the usual video editing tools to it. You can change things like white balance, cropping and zooming, add keyframes, add fade-in and fade-out, color grade, apply presets, or add soundtracks or titles. And you can of course combine clips, etc, to make more sophisticated edits between shots. Basically, the sky's the limit here. To do any of those, you're going to want to work with the storyboard panel at the bottom, and it'll start looking more like this. But that get's us well beyond the scope of this particular walk-thru. 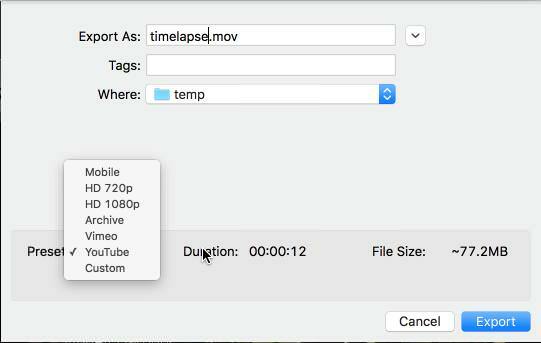 If you're looking for the simplest possible way to export a basic, simple timelapse clip, you can skip the storyboard panel. Once you're happy with the basic settings, click on the Export step. You'll immediately get a browser window where you can name the exported file and select where to save it. More importantly, you can also choose the settings to export it at. There are some presets with settings optimized for particular uses, including Youtube and Vimeo. 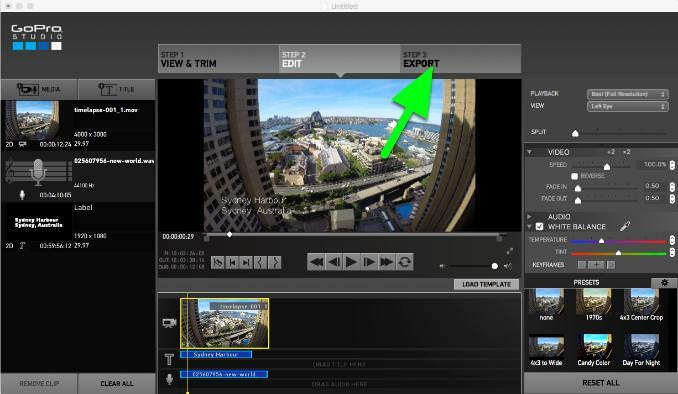 If you want more control, you can choose the Custom option and specify individual settings, including the ability to export to GoPro CineForm format. If you're looking to keep things simple for uploading the web, the Youtube preset is a good place to start. Once you hit the Export button, you're good to go! If you want to save the project in order to be able to come back later and make further edits, go to File & Save Project.